More than a century after his death, Oscar Wilde still intrigues us. This poet, novelist, playwright, and essayist was also his era's leading aphorist. George Bernard Shaw called him "incomparably the greatest talker of his time -- perhaps of all time." The personality of Wilde as a consummate conversationalist was admired by everyone who encountered him. The smooth flowing utterance, sedate and self-possessed, oracular in tone, whimsical in substance, carried on without halt, or hesitation or change of word with the queer zest of a man perfect at the game. So perfect were Wilde's verbal thrusts that his victims were often flattered to have been the cause of them. Wilde claimed he could discuss any subject at any time prepared or not. A companion once took him up on this claim, asking that he discourse on the subject of "The Queen." Wilde retorted instantly- "The queen is not a subject.' Another time a journalist told him, 'I never discuss subjects on which I don't know the facts.' Wilde quickly observed, "That must limit your conversation frightfully." Now and again Wilde found himself bested at banter. One occasion took place in America when a lady told him something was 'awfully nice'. Wilde once watched one of his old professors give a lecture in London. The man was painfully soft spoken. Afterward, he asked some of the members of the audience if they had heard him. 'Overheard, now and then', said Wilde. 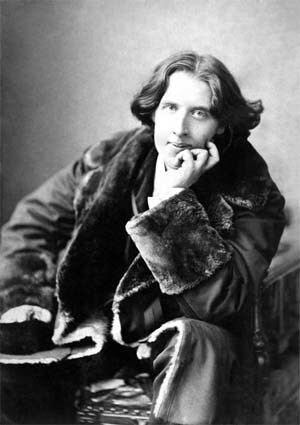 The French actor Coquelin once invited Oscar Wilde to visit him at his home. Wilde asked when he would be there. Before leaving London for a lecture tour to USA in 1882, Wilde took elocution lessons from a friend. 'I want a natural style ', Wilde told his teacher, 'with a touch of affectation'. One of his favorites story about America involved those the southern states whose older citizens dated the important events before the Civil war. 'How beautiful the moon is tonight', remarked Wilde to a Southerner. 'Yes', the old southerner replied, 'but you should have seen it before the War'. While touring in USA, he lingered in New York thinking that someone might produce his play 'Vera'. When a theater manager offered him advance on condition he makes some changes in his script'. He replied demurely, 'Who am I to tamper with a masterpiece?'. Wilde himself liked this wit so much that he used to repeat it on many occasions. At the end of his lecture tour, Wilde developed a stock response for those who asked how it had gone. 'A great success', he would tell them. 'I had two secretaries. One to answer my letters and the other to send locks of hair to my admirers. I have had to let them both go, poor fellows: 'One is in hospital with writer's cramps, and the other is quite bald'. During a dinner conversation, Wilde told a host that he'd toiled strenuously that day. "I was working on the proof of one of my poems all the morning and took out a comma," he said. "And in the afternoon?" she asked. "In the afternoon," responded Wilde, "-- well, I put it back again." As this legendary genius rightfully observed, 'Life does not cease to be funny when people die any more than it ceases to be serious when people laugh'. Good conversation is an ephemeral art, and as the autumn breezes blow brown leaves to eternity, the spring green freshness becomes only a memory. So it is with Oscar Wilde. The wicked wit of Wilde still glows green.